Published in the Dover Express, 7 December, 1979. Two old Dover charities were later transferred to the Trust — £5 a year from James Hughesson’s Charity; which was intended to be given to six poor widows of freemen, and Neild’s Charity, £800 three per cent consols, left by James Neild in 1810, to be given in bread to the discharged debtors of Dover Castle prison - which, of course, has long since ceased to function. The almshouse funds were not used to support the inmates, their maintenance having to come from their own resources or from friends. Worthington Street, Priory Street, Priory Place, Priory Road, Saxon Street, Norman Street and Effingham Street are mostly modern. Worthington Street is the oldest, being now in its third stage of existence. This street is first mentioned in history as Gardiner's Lane. Who Gardiner was, is not known; the family is not mentioned in any Dover history, but the name seems to have been associated with this lane since the reign of James I. The lands on the west side of Biggin Street, when the Priory existed, belonged to that monastery, and it is probable that, after its suppression, when the land was let to tenants of the Archbishop of Canterbury, this lane was opened as an occupation road from Biggin Street to the Priory fields. Possibly Gardiner was one of the Dover tenants. Gardiner’s Lane, previous to 1783, was the principal outlet from Biggin Street to the Priory, Maxton and Hougham. In Gardiner’s time, it was, doubtless, a mere cart track through a field. It is impossible to tell when the first buildings were erected, but in any case no building of any great age has survived into the 1970s. The name was changed from Gardiner's Lane to Worthington’s Lane about the year 1800, the Worthingtons being then a powerful family in Dover, having their suburban residence at the Manor House, Maxton, on the site of which is now a petrol filling station. There was Lieutenant Benjamin Worthington, R.N., who was a resident of Dover all his life, except when he took part in the Naval operations during the wars of Napoleon; and who, in his later years, occupied his leisure in projecting schemes for the improvement of Dover Harbour. There was also a Mr B. Worthington in the Corporation, in 1799 — probably the father of the lieutenant; he, for many years, kept the "Ship Hotel" on Custom House Quay, long known as "Worthington’s Ship Hotel." He also ran Dover and London coaches; and there was another of the same family who was a wool stapler, whose warehouses were in this lane, and, eventually, gave it its second name. The warehouses, which were built mainly of wood, were, in later years, converted into fodder stores, a slaughter house, and stables, much to the detriment of the thoroughfare. 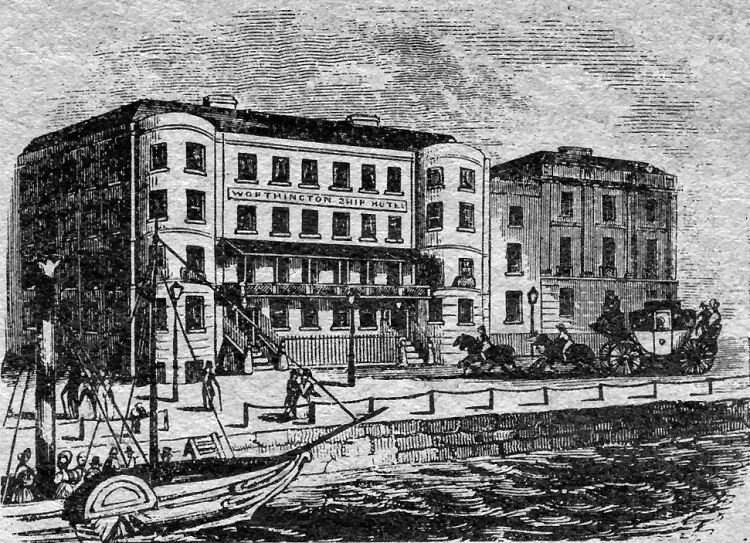 The above also published by Batcheller, in 1841, depicts Worthington’s Ship Hotel, on Custom House Quay. At the upper end of this lane, until 1860, there existed a well known weighbridge, the property of Mr Joseph Groombridge, who, in 1860, removed it, and sent in to the town council plans for building on the site. To this the council objected, contending that the proposed building would greatly narrow the lane, the public having the use of the space where the weighbridge was. They insisted that the new buildings should be kept back in line with the frontages below. Mr Groombridge succeeded in proving that the site of the weighbridge was his to build upon if he chose, and the council admitted his claim, which was settled by the 105ft. being surrendered to widen the top of the lane, for a payment of £80. As part of the Streets Improvement scheme, in 1895, the lane was again widened, and it was proposed to change its name to Military Avenue; but there were strong objections to the old name of Worthington being wiped out, and the change was confined to the substitution of street for lane. Until about this time there was a wooden post in the centre of the lane to prevent its use by horse-drawn traffic. Priory Street has associated with it very little history and contains no building of any great age. The "Golden Lion," at the top corner dates back to at least 1846 however. When the new Folkestone Road was laid down in 1783, this street was made from St Martin’s Hill to form its communication with Biggin Street. There were no buildings on the north side of Priory Street until after 1838, when those premises up to Priory Place, and the house at the Biggin Street comer, the residence of Mr Joseph Webb Pilcher, were sold. His stables, coach house, and a small windmill stood near the top, these being removed the same year, and the bakery built at the top corner, facing Priory Place. It may be incidentally mentioned that, in 1846, this baker’s shop was occupied by Richard Kennett, and it was robbed one evening in that year by a then notorious Stephen Clark, who, was one of those implicated in the murder of Police Constable Couchman at Bridge Street in 1844, For the murder he was acquitted at the Assizes, but Mr Bodkin, the Recorder at the Dover Quarter Sessions, adjusted the balance of retribution by sending him to penal servitude for life for this Priory Street robbery. Where the Post Office stands on the north side was once Palmer’s coach building works with showrooms at the corner, which was built by Mr J. N. Tunbridge, in 1873; while the buildings on the south side are of various dates. Priory Place was that part of the road that extended from the foot of Military-Hill to the top of Priory Street. With the construction of the York Street dual carriageway it has all but disappeared, the handful of properties on the east side being all that remains. Before 1895 it was bounded on the west side by the "Red Cow" yard near which, backing onto Military Hill, were four cottages. The end one, next to Worthington Street, was a very old milkshop, probably the earliest of its kind in Dover where, at one time, a Mrs Marsh dispensed the products of Priory Farm. In front of these cottages was a railed-off space, paved with cobblestones, where cheap jacks sometimes sold their wares. The whole of the property on that side was swept away by the 1895 street improvement, and was rebuilt. The buildings on the east side of Priory Place were not affected by the improvement. These included Mr Edwin’s draper’s shop at the corner which was for years a landmark. This later became Messrs Clouts the ironmongers which continued in business until the late 1970s and is now converted into the Dovorian Restaurant and hotel. THIS interesting picture of the junction of Priory Place, Worthington Street and Military Road dates from about 1895. In the centre is the milk shop referred to earlier. Here it is pictured when the proprietor was C. Fry who, apart from selling milk products of the Priory Farm dairy, sold lemonade, soda and ginger beer. 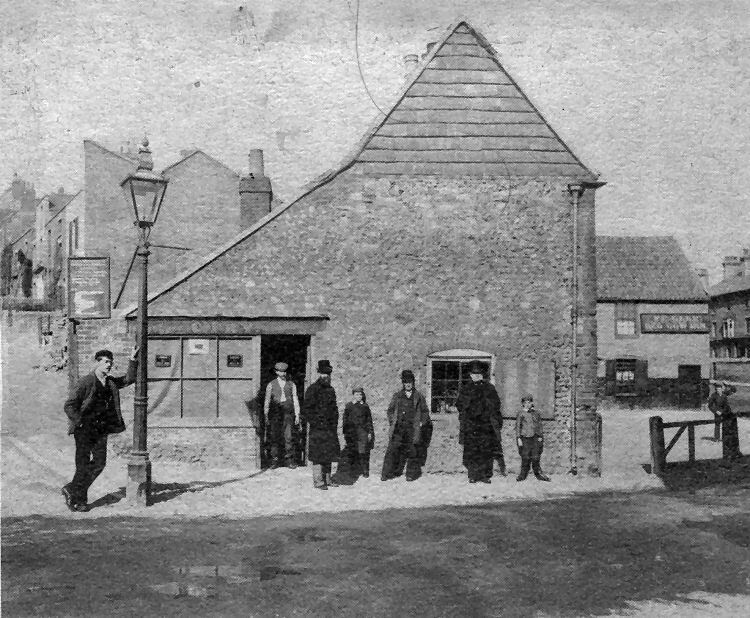 On the right is "Ye Olde Red Cow Inn" and yard which stood on the corner of Folkestone Road and Priory Place. An interesting public notice board on the left appears to have been put up by the RSPCA whose secretary Mr W. Wollaston Knocker asked the public to make complaints about cruelty to animals — which were used on a large scale for haulage work — in writing to him. An interesting engraving by W. Burgess of the medieval Maison Dieu as it appeared when used as a victualling office for the Royal Navy and later an Army store. 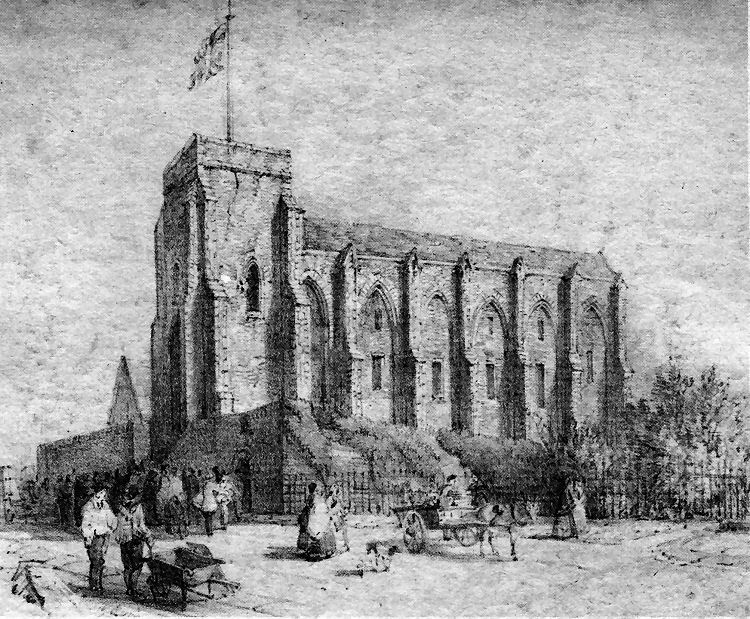 Believed to date from 1831 the engraving was included in a leaflet dated February 1852 which was published In support of an appeal for donations to restore the building. When Dover Corporation bought the Maison Dieu in the early 1830s the ancient windows were bricked up and the roof had no ceiling. Cost of restoration was estimated as being upwards of £2,000.